Aju R is teaching Architecture since 2000. 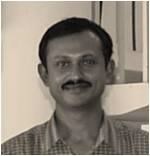 He is currently working at Department of Architecture, College of Engineering Trivandrum. Prior to this appointment he was working as lecturer in School of Architecture, Government Engineering College Thrissur. Before his teaching career he was senior architect at Jayachandran and muralee associates, an architectural consultancy at Thiruvananthapuram, and Junior animator at Toonz India Pvt. Ltd., an animation firm in technopark. Involved in the design activities of S1 studio projects. Involved in he design of RUSA design projects in CET.